For me, it is impossible to separate my professional training and personal identities from my experience living in my Midwest cohousing community. As a queer, Latina, cisgender1 woman, I easily pass as a straight, white female. I have been married to a cisgender Mexican male for the past seven years. We have two children who were both assigned male at birth and who will determine their respective gender identities and sexual orientations over time. My eldest is technically my step-son, but our bond is beyond biology. He is half-white and half-Mexican. Our youngest is half-Mexican, a quarter-Cuban, and a quarter-white. My white mother lives two doors down from our house in the same cohousing community. My family lives in a relatively wealthy, highly educated town, but we would not have been able to purchase our home in this cohousing community had it not been for the post-recession drop in housing prices. We purchased our home from a bank after an eight month waiting period for a “short” sale. We learned about the short sale opportunity through my mother, who has lived here since 2002. I share all of this very personal information to locate my intersecting identities of privilege and marginalization, as they inform my viewpoint. These identities also guide my personal and professional work for self determination and liberation. My background and social identities influence how I experience the world and how others view and make assumptions about me. As a result, I have dedicated my academic and career trajectories to focusing on social justice, diversity, equity, and inclusion. I launched a consulting company in 2010 to support nonprofits and universities in strengthening these areas. Yet, when I moved with my family to this predominately white, progressive cohousing community, I was initially stunned by the implicit bias, microaggressions, overt acts of racism, stereotyping, and other racist and homophobic experiences we have had to overcome in order to continue living here. While these struggles have been, and continue to be taxing, I know that we would face similar issues in other neighborhoods that were not also trying to build intentional community. We stay here because there are also many bright and positive advantages to living in this community. For us, the biggest draws are twofold: my mother lives two doors down (our kids have two refrigerators to raid!) and our children delight in having a solid group of supportive friends of different ages, always ready to play zombie tag at any given moment. What a double blessing! While we have enjoyed these advantages, our initiation to living in cohousing was quite jarring. Three months after moving into our new home, a serious conflict erupted regarding a display for Día de Los Muertos in the Common House, and we were the catalysts. 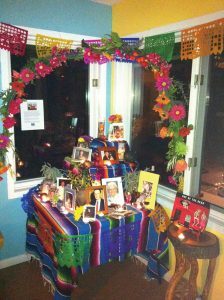 Our idea was to assemble a temporary, traditional altar for Day of the Dead in a well trafficked area of the Common House where neighbors could leave photos of loved ones who had passed. The display would last for two weeks and culminate in an evening celebration with neighbors, drinking atole, eating pan de muertos, and sharing stories. Typically in Mexico and Central America, beginning in October, families create ofrendas to celebrate loved ones who have passed, and leave them on display for weeks. My husband shared with me that where he is from, families first present sugar skulls, sweets, toys, and other food to honor deceased children (angelitos) to help their spirits return to earth on November 1st. This annual tradition culminates in the afternoon of November 2nd when families head to the cemeteries to clean and decorate the tombs where deceased members of their family are buried. Families spend all night through the morning of November 3rd in the cemetery with candles and food, sharing stories to remember their ancestors. In our community, we came upon an unwritten rule that prohibited religious or seasonal displays in the Common House, such as Christmas decorations, lasting over a period of multiple days. This rule came about, in part, because a neighbor whose Jewish ancestors were brutalized during Christmas was very triggered by such displays. It was not a formal policy. Being new to the community, I did not know about this unwritten understanding. After collaborating with other neighbors to sponsor this event, we were surprised when several community members were very displeased with our community-wide invitation to set up this Day of the Dead display. My neighbors’ general disagreement emphasized that “it was inappropriate” for there to be Christian iconography on display in our common spaces over the period of two weeks. While my husband and I shared that this ceremony was rooted in pre-colonial indigenous spirituality that was syncretized with Catholicism due to European colonization and imperialism, this historical context did not change our neighbors’ objections. A painful conflict ensued. I set up the display in spite of the dissension from several community members and I take responsibility for my contribution to the escalation of the conflict. In the end, the display was beautiful (please see the photo) and the event was well attended by many adults and children. However, we have not had another Día de los Muertos, done in its original cultural context, in the Common House since. One year after the Day of the Dead conflict, Tim Hartnett, author of Consensus-Oriented Decision-Making: The CODM Model for Facilitating Groups to Widespread Agreement, presented a dynamic training in our community. Stemming from this training, the community changed key policies in our Book of Agreements. Five years later, we have seen the paradigm shift with regard to our decision-making processes. In some ways, I think CODM allows us to make certain decisions at a faster pace, and for other decisions, the process feels more tedious. All in all, our ability to include and honor multiple perspectives during the process of making a decision is laudable. I am grateful for the evolution of our decision-making rules resulting from the adoption of CODM. My initial orientation to cohousing made an indelible impact on me. I realize now that I naively made certain assumptions about my neighbors and expected them to all be friendly with me. I quickly learned that this was not the case, and that is ok. Exactly six years later, I would like to say that I turned this experience into an opportunity for learning and practicing setting boundaries with others. Now I share intimate information with only a few close neighbors who have become friends. As I reflect on other times of conflict in the community, I recognize that we all bring into community our respective social identities of privilege and marginalization, relationships, histories of childhood trauma, and present-day struggles. All of these factors influence how we interact and show up in conflict. NPR highlights that as of July 1, 2015, 50.2 percent of babies born that year were babies of color in the United States.7 This statistic includes my preschooler. The US Census predicts that by 2044 the racial and ethnic demographics of our country will have shifted so that there will be more people of color than non-Hispanic white people. Given this future shift, at what point will these sectors, including intentional communities, also shift to reflect the demographics of our country? How can we accelerate this change so that cohousing communities actively engage and reflect the demographics of the general population? What are the barriers to making this shift happen? This is an area of focus I tackle on a daily basis in my professional role. But at home, I recognize that my cohousing community and the intentional communities movement are at the beginning of collectively designing strategies to effectively move the needle. As noted in the data above regarding the demographics of intentional communities, the majority of members reflect privileged identities. Those with privileged identities include people who are white, male, heterosexual, middle-to upper class, able-bodied, and/or Christian adults. I do not highlight these identities here to attack, blame, or shame anyone with any combination of these privileges. Encouraging guilt leads to inaction. Rather, I advocate that people with privileged identities leverage their privilege to learn and make change. This momentum forward starts with explicitly naming and recognizing one’s identities that hold privilege. In my experience, the homogeneity reflected in cohousing communities lends itself to a severe lack of collective awareness and action regarding issues of power, privilege, and oppression. Most of my white neighbors have not actively evaluated their implicit bias, white privilege, white fragility, white savior complex, bias toward colorblindness, or complicity with white supremacy. It’s hard stuff, and I’ve certainly made mistakes along my path to understand and accept my racial identity. But this remains a primary barrier to cultivating inclusive and diverse cohousing communities in terms of race, ethnicity, socioeconomic status, gender identity, sexual orientation, ability, age, and other markers of difference. Social networks tend to be comprised of people with the same racial and ethnic backgrounds as one another. One of the most powerful recruitment strategies for new cohousing community members is through current members’ individual spheres of influence. This is how my family moved to the same community where my mother lives. So when 75 percent of white people have only white friends, they are not likely to actively recruit new neighbors of color who fall outside of their social network.8 Also, people of color want to avoid being tokenized and marginalized by their neighbors. For some, joining a homogeneous neighborhood of the powerful racial group feels like a threatening proposition, regardless of any positive intent from the current residents. Diversity in background and styles of communication and behavior will lead to explosive conflict when unconscious bias is also present. People have different communication, behavior, and conflict styles, which show up in daily interactions as well as moments of division. This is actually an asset, but it can serve as a barrier when we unconsciously, collectively ignore this fact. A study mentioned in a September 2016 Harvard Business Review article demonstrated that “homogenous teams feel better—but easy is bad for performance.”9 For example, if a community is comprised of primarily introverted white baby boomers, then an extraverted millennial family of color with a child moves in, the community is primed for conflict. Why? Because if some members hold an unspoken assumption, or unconscious bias, that this new family should conform to the cultural norms of the more seasoned residents, it is only a matter of time before conflict will erupt. This was basically my experience. Howard Ross says, “We do not think the way we think we think,” which means that we do not consciously recognize if we are taking part in unconscious bias.10 This is why it is important to be aware of intent and impact. My neighbors were positive in their intent to inform me of the unspoken rule regarding the presence of Christian imagery in the common house, but the impact of their communication and behavior resulted in painful conflict. Conflict aversion will result in ostracizing and marginalizing individual members and their families. In general, those within white culture do not have to consciously realize that their cultural norms are upheld as the standard. It is possible that individuals involved in a conflict within community are already marginalized in the broader society based on their oppressed social identities. When a conflict arises, these power dynamics are present. Often the voices of those with privilege are elevated and those with marginalized identities are further marginalized. While this may not always be the case, we cannot separate systemic and structural oppression from any interpersonal interaction. Create and commit to an action plan. An action plan can help a community strategically increase racially diverse households, tying together goals with activities, outcomes, a timeline, and resources. Action planning starts with establishing strong, shared mission, vision, and values statements that all members embrace. Refer to these statements and action plan at every community meeting. Volunteer community leaders need to address conflict immediately. Managing conflict is not easy, but it is critically important. As soon as a conflict arises that impacts three or more members of a community, leaders within the community need to draw from existing norms, processes, and policies to engage the broader community in the conversation. If these norms do not exist, they must be created in order for the community to function effectively. Anyone aware of the conflict will have an opinion on the situation, and those impacted will desire to communicate their perspectives. There are structures to facilitate difficult conversations, such as restorative or listening circles and other participatory facilitation techniques. Make sure to intervene using these participatory methods immediately to not allow the conflict to quietly fester, because the community will reach a boiling point. Once the conflict explodes, community members’ energy must shift to damage control. Heading off an explosion is generally a more pleasant course of action. Hire an outside facilitator, trainer, or mediator. Someone who does not live in the community may best assist with leading community change processes. Because we all come with our implicit biases, relationships, and histories, no current cohousing member will be seen as impartial or neutral on contentious topics or areas of serious conflict. Plus, each member should be able to participate in the change process and it is very difficult to be both facilitator and participant because of the inherent power dynamics involved. Acknowledge your community’s contribution to perpetuating systems of inequity. Recognize the indigenous community’s land on which your community is built. Acknowledge and reconcile if your community is actively contributing to the gentrification of the area where you are located. Pool a donation to support a local community-based organization that promotes economic justice and/or fair housing. Recognize this is a lifelong journey and evolution for each of us as individuals and as a collective community. b. Trainings: Host annual trainings that examine systems of power, privilege, oppression, implicit bias, microaggressions, childhood sexual abuse and trauma, homophobia, transmisogyny, white fragility, white savior complex, and/or white supremacy. d. Activities and events: These can be related to themes of race, racism, anti-racism, racial justice, and racial equity, targeting residents or opening up to members of the broader community, town, or city to attend. e. Workshops on personality, conflict, and/or communication styles: Individuals can complete the Myers-Briggs Type Indicator, TKI Thomas-Kilmann Conflict Mode Instrument, or the Intercultural Development Inventory about intercultural communication to begin a meaningful conversation at the individual level and then explore a community’s unique landscape of different styles. f. Avoid using the word “safe space”: Interracial, mixed gender spaces to talk about race are historically unsafe for people of color, women, trans, and non-binary individuals. In my role as a facilitator, I have heard participants with marginalized identities say this because these individuals experienced that the “safe place” was not meant for them, but for the participants with privileged identities. Frame the space as a “brave” space instead. Begin collecting data on the racial and ethnic demographic composition of community members. Any respondents should self-identify, and no one should assume anything about another’s identities. Track other demographic markers of difference as well, including gender identity, sexual orientation, age, ability, socioeconomic status, religion, etc. In order to illuminate the demographics of those who comprise the intentional communities movement in this country and track any changes over time, we need these data. Likewise, we need to provide opportunities for those who have done this work in the broader community to share it with others in the cohousing community. If you are a white person, listen to people of color. Engage current and prospective members who are people of color in conversation. Listen to them when they speak at meetings. Do not interrupt. Notice if you start feeling defensive. Do not make the conversation about you. Just listen. Hear what they have to say and thank them for sharing their opinions. Do not expect them to teach you things; that is not their job. Read The Four Agreements by Don Miguel Ruiz. It is a quick read and valuable resource for life, as well as living intentionally in community. Unfortunately my cohousing community has not updated its vision, mission, or values since 2003. One of our values still reads, “Deal with diversity of thought.” That is not language that is likely to inspire and intrigue potential members of color to move here. In fact, our ongoing efforts to update our internal vision and values have started, stopped, and sputtered over multiple years. While I am hopeful that we will be able to revise and update this critical, unifying component to building our intentional community, I do not know when it will happen. But I do know that for as long as I continue living in this cohousing community, I will approach each experience as an opportunity for learning and growth. My mother’s late friend said, “Cohousing is the most expensive self-improvement project you can find!” I wholeheartedly agree. The cost is not just monetary, but also emotional. For me, this cost is worth it because I continue to learn so much about myself and others in an environment filled with people who are also intentionally growing alongside me. A mother, entrepreneur, and social justice activist, Rosemary Linares is devoted to promoting social change through capacity-building work in the nonprofit sector. Connect with her via her website at www.cmsjconsulting.com. Cisgender means identifying with the gender assigned to me at birth and not identifying as transgender, non-binary, or gender nonconforming. By avoiding generalizations about groups of people and speaking from our own personal experiences, feelings, or beliefs, we demonstrate the act of holding ourselves accountable and avoid attributing these feelings, beliefs, or judgments to the listener. Although I may have positive intent in saying or doing something, if the effect of my statements or actions is negative, I need to hold myself accountable for the impact I made, in addition to the intent I brought forward. “Both/and” thinking is a discipline that can replace thinking in terms of “either/or.” For example, “race and ethnicity” can be both a social construct with no real basis in science and it can have very real historical and present-day implications. This work is challenging and ongoing. We may never come to any conclusions in our lifetimes, but we can commit to the learning journey and evolution, accepting nonclosure. We also need to lean into the discomfort in order to stretch and grow.